Do we shut off the tv until they reach 2? We don’t think anything of it. Television is such a normal part of our lives that many of us don’t think twice about leaving it on in the background. And truth be told, it can be incredibly useful – whether it’s providing entertainment for the little one and giving us a few minutes of much needed break time or the only “other” adult voice heard for most of the day – it can feel like a lifesaver. Unfortunately, acording to Dimitri Christakis, director of the Center for Child Health, Behavior and Development at Seattle Children’s Research Institute and professor of pediatrics at the University of Washington School of Medicine, television exposure during the early years can also be associated with language delays and attention problems. So much so that the American Academy of Pediatrics is discouraging television watching before the age of two. According to Christakis’ study of 329 2-month to 4-year-old children and their parents, each hour of television exposure was linked to a decrease of 770 words the child heard from an adult. There was also a decrease in child vocalizations and child-adult interactions. 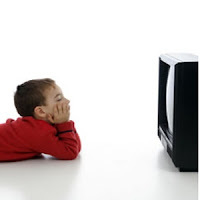 Of course the reality is that some of these results were directly related to children being left in front of a TV, however others reflected adults who while present were distracted by the television and not necessarily interacting with their child. And “hearing adults speak and being spoken to are critical exposures that play a role in infants development in language” according to Christakis. On the surface, having read this article I would be very hesitant to put my child down in front of a tv…after all, there’s no way I’m going to be the reason my baby has speech delays or attention problems. The first sentence was clear: “even infants zone out in front of the television, and it turns out this translates into less time interacting with parents and possible lags in language development…” But on another read…and a second and a third, I hesitate and then I slowly rethink my position. The facts when I sit down and take a good look at them are that the study clearly states it did not measure whether or not anyone – parent or child – was actively watching the tv or if it was just in the background. And the number one stated result was that the child heard 770 words less from an adult for each hour the TV was on but it never stated how many words the adult actually spoke during that time. It points out that interaction is key for babies brain but then proceeds to recommend that children under age 2 be discouraged from watching television. Maybe it’s me but my gut says they’re missing the point. The interaction as well as the distraction – they both start and end with us. It’s us, not the children that can’t handle the tv being on in the background. Maybe we’re the ones who need to be reminded to walk away…because if the study told us anything, it’s that it can be tough for us to tune it out…and the one thing we never ever want to do is tune them out.